MICHAEL KELLY The Marietta Times Nine-year-old Annie Ruth left, a fourth grader in Lori Estes’ class at St. Mary Catholic school, said she’s given up fighting with her sister for Lent. Classmate Grant Huffman, right, also 9, has been making dinner for his family two days a week. Out in the community, if you look closely, many people are under some degree of stress right now. But it’s for a good cause. This is Lent, a period intended to mirror among Christians Jesus’s voluntary deprivation in the wilderness in his last days on Earth, and many give up some favorite indulgence to honor that. Nominally 40 days, Lent this year is actually 46 days in duration, starting on Ash Wednesday, which was Feb. 14, and continuing through the end of Maundy Thursday – March 29, the day before Good Friday. The count of 40 days doesn’t include Sundays. The Lent commitment traditionally includes a pledge to give up unneeded and sometimes detrimental food and drink, with sweets, chocolate and soda being among the most often foresworn. It can also include unseemly behaviors, such as swearing. Lent is observed among nearly all Christian churches but most regularly by Catholics, Episcopalians and Lutherans, and it is an annual affair particularly at parochial schools. At St. John Central Grade School in Churchtown, four students talked about the meaning of Lent and how they chose to mark it. His sister, Sophia Huffman, a year younger, has been drinking a lot of water since Valentine’s Day. “I gave up sweet tea, and yeah, that’s one of my favorite things,” she said. Hayden Suprano, 13, has changed his breakfast routine. Lakyn Brooker, 12, is staying away from her favorite beverage, Sprite. Like Sophia Huffman, she’s been drinking a lot of water. “Jesus gave up his life for us, and we should be able to give something up for him,” she said. 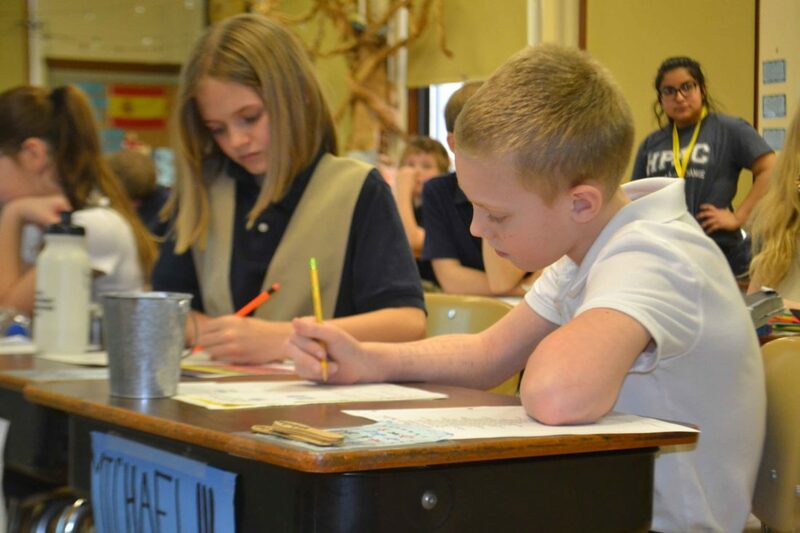 In Marietta, St. Mary Catholic School encourages students to make something positive out of Lent beyond giving up a favored habit. Assistant Principal Molly Frye said Lent comes under discussion in the school’s religion classes and, of course, at Mass. In Lori Estes’ fourth grade class, Annie Ruth, 9, said she gave up fighting with her older sister for Lent. When asked whether it was hard, she just replied with a solemn nod. Grant Huffman has been sacrificing his time and energy to a household cause. “I’ve been making dinner at home Saturdays and Mondays,” he said. Younger children don’t need to make any such sacrifices, kindergarten teacher Jocelyn Smith said, but they are encouraged to think about what older children and adults might be encouraged to do for Lent as a sort of character-modeling exercise. The older kids in the school showed interest in helping those around them. Olivia Huck, a 13-year-old in Amanda Parman’s seventh grade class, said she’s helping the needy. “I made a schedule with my dad to help at the Daily Bread Kitchen,” she said. Riley DePuy, 12, has pledged to improve domestic harmony in his household. “I’ve been babysitting my (three) siblings so my parents can have more alone time,” he said. Personal improvement is also on the Lent agenda. “I’ve tried to give up the nervous habit of biting my nails,” said Bella Choven, 13, looking with resignation at her short-nailed hands. Rowen Baker, 13, offered a philosophical summary. “It’s not necessarily giving things up but making a change in our life,” he said. After Lent, of course comes Good Friday and Easter. In Marietta, a traditional observation of Good Friday is scheduled this year involving five churches and the carrying of a cross. Carol Cisler, senior warden at St. Luke’s Episcopal Church, said the Walk of Witness will began after noon services, with the congregation leaving the church behind two people carrying the cross. The procession will go down Second Street to Putnam and across to the First Congregational United Church of Christ, and after a service there move to the Christ United Methodist Church, then to the Presbyterian Church at Fourth and Wooster streets. It concludes at the Basilica of St. Mary of the Assumption, where after a service a pantomime performance of The Passion, observing the Stations of the Cross, will be held. The event will conclude at 3 p.m.
¯ Fast from a favorite food or beverage. ¯ Fast from a bad habit. ¯ Fast from a favorite activity. Source: Christianity Today, citing Lifeway Research.